Another book binge has me excited about science fiction again. 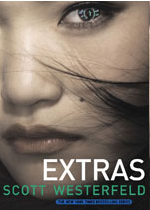 Extras by Scott Westerfeld is the fourth book of his Uglies series. When he finished with Specials, he had tied everything up in the universe so neatly that I truly thought there was no where else he could go, but I loved the series, so I bought the hardcover of Extras without even reading the blurb on dust jacket. I trust Scott Westerfeld to give me a good story enough to buy his books sight unseen. I really related to Aya Fuse, the main character of Extras. She is a Kicker. She films stories of things going on around her and puts them up for all to see. She doesn’t do it for survival. She has a room, food and medicine if she is sick. She does it for fame. She is always accompanied by her hovercam, Moggle, and she is always filming. Just like me, everything she does is something she could be telling the world about on her feed. While following a story about rogue girls mag-surfing a train, a dangerous stunt, she falls into an even bigger story. Something that just might consume her. If the fame from her story doesn’t suffocate her, the fallout from its implications just might. It’s an amazing romp through the Uglies world that was fresh and new. Aya’s world is based on whuffie, or fame. The more famous you are, the more luxuries you are allowed. Even though I was familiar with a version of this world from Down and Out in the Magic Kingdom, Scott Westerfeld took it to a more imaginative level than Cory Doctorow. Turns out if you never lie, there’s always someone mad at you. I guess sometimes you have to lie to find the truth. These quotes have to do with the new trend in brain surgery, Radical Honesty, where you cannot lie, even if you want to. It’s an interesting look into the meaning of being human, right down to lying. Extras is an excellent addition to the Uglies series.